What Kind of Sword is This? Recently bought this sword, but I have no idea from where or when it was made. It's heavy and it's big. Blade looks like it's European, but the grip and decorations look Asian. Anybody have any insight? Comments for What Kind of Sword is This? 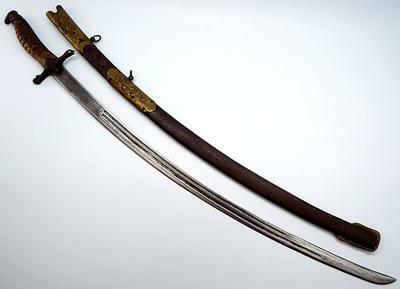 Take what I have to say with a grain of salt, as antique swords are not my area of expertise - and it is a little hard to see from the picture, but I tend to think it is probably a 18th or 19th century Indian Saber. I could be wrong, but if I had to guess it is either Indian or Mughal. The overall shape of the blade and the cross-guard suggest this to me, while the hilt is a bit atypical - the typical Indian Saber, called a Tulwar/Talwar usually had a disc shaped pommel, but I have seen them with other shapes and still technically called 'Tulwar/Talwar'. The hilt further evokes to me the style of sword popular in the 1800s (Cavalry Saber) though minus a hand guard, so I totally understand why you might be a little stumped by its origins. If it is what I think it is, it's value is somewhere in the vicinity of $400 to $600 - but because it is seemingly quite unique, it could be more.. But again, take what I say with a grain of salt. Will see if anyone else has anything to say on it.